Has your roof suffered storm damage? Call today! Avoid out of pocket costs in Miami & Panama City, FL and throughout the state! Arm your roofing system with commercial roof wrapping. Prevent additional damage with a roof wrapping service. See how our roof wrapping service works. Ready to schedule with us? Fill out our Contact Us Form today. After a storm hits, the damage can be devastating; especially to your roofing system. Although rescue organizations mean well by providing tarps, the material isn't durable enough to truly protect your roof. Instead of inviting additional damage, invest in a roof wrapping service. Weatherproof Wraps is a roof wrapping company based in Miami, FL. We'll make sure your roof is protected from additional damage. We deal directly with your insurance company. Call us today to schedule your service in Miami, FL or else where in Florida. What sets Weatherproof Wraps apart? Call us today to schedule your roof wrapping service in Miami, FL and throughout the state. Skilled technicians at roof wrapping with Polyethylene sheeting. Knowledgeable experts in the disaster relief industry. A highly mobilized team that can effectively serve any residential area, home or business. A company that believes in building long-term customer relationships through transparency, due diligence, and honesty. 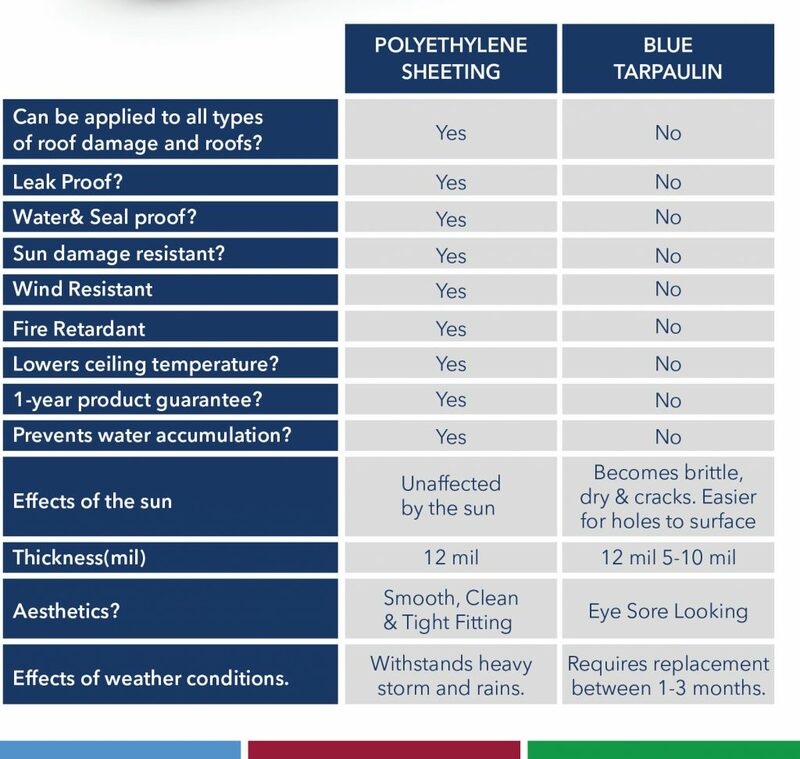 What is a Polyethylene Roof Wrapping and its benefits? ensures home and property owners more time to secure a permanent solution. Overall, Polyethylene roof wrapping is a better-suited material for heavy-duty roofing applications. Simply put, blue tarps don't work! Mold and Mild Dew: Leaks cause an excess of moisture in your home, and this can lead to a host of problems. Mold eats away at materials like wood, paper, and fabric. Don't forget to tally the potential cost of repairs and replacement for wallpaper, carpet, and ceiling tiles if mold is left unchecked. Extreme cases can damage a home so badly that it can never be repaired, and that's after the dangers of ceilings or walls collapsing. Poor Health: Not surprisingly, if mold does that kind of damage to the inner framework of your home, just think what it's doing to you! Common complaints after exposure to mold include nasal stuffiness, scratchy throat, itchy eyes, and coughing. Even though in small amounts it doesn't necessarily affect everyone, people cursed with mold allergies or chronic lung illness can have more severe reactions that affect their breathing and lead to the need for medical attention. Damaged Insulation: Leaking roofs allow water to seep in everywhere, and yet another thing you would need to worry about in this scenario is the cost of replacing your insulation. Wall and ceiling insulation can become saturated by excess water coming in, essentially destroying it and its effectiveness. Structure Damage: Water-logged homes can lead to rot in the wood holding your home together. When this happens, homes start to have issues with the very structural supports holding them upright. For example, walls may start to bow, the roof will start to sag, and the house's foundation itself can become spongy. Fire Hazard: If water is coming in through your roof, the ceilings of your home will be affected, not just from the possibility of collapse mentioned earlier, but also the very real danger of the water combining with electricity. This can lead to safety concerns like electrocution or even electrical fires. High Energy Bills: When your insulation is waterlogged and is no longer doing its job, your home has essentially developed a slow leak of precious energy resources. Heat escapes the house more quickly, causing your furnace to work harder to keep things warm during winter months. In the summer, pricy air conditioning bills have consumers looking for every possible way to keep their homes cool and properly-functioning insulation is key. All of this is aside from the fact that every bit of energy conservation helps the environment in the long run. Slip and Fall: While it can be funny in the movies and in sitcoms, slipping and falling is no laughing matter in real life. In fact, the World Health Organization estimates that 37.3 million people's falls each year are so severe that they need medical attention. Water in unexpected places can cause slippery floors increasing the risk of someone in your home falling and injuring themselves. Copyright © 2019 Weatherproof Wraps, all rights reserved.